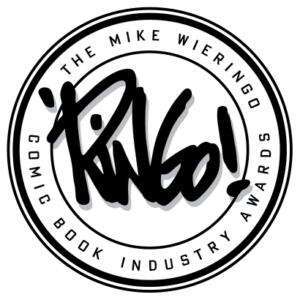 Last year marked the debut of a new award at the Baltimore Comic Con (a show I used to attend regularly when I lived in the city), the Ringo Awards, named for the popular late creator, Mike Wieringo. They're coming back for 2018, and until May 30th, anyone, fan or pro, has the opportunity to nominate for the awards. The rules for the award can be found here, and they're a bit lengthy due to being a hybrid nomination system. The short version is that the top two picks in open nomination and the top three picks in juried nomination make it to the final ballot, which is voted on by pros only. This reduces, at least in theory, ballot stuffing. All nominations must be based on the prior calendar year (so in this case, 2017). Last year's winners are listed here, and I hope they improve the presentation a bit for the future. I found trying to see who the winners were rather difficult. They include creators such as Tom King, Fiona Staples, Todd Klein, and more, alongside titles such as March Book 3, the Love is Love anthology, and Bloom County. People's opinions on awards vary, but it's always fun to get nominated for something (just how fun I learned when we got nommed for an Eisner), so it's cool to see this continue into a second year. Remember that nominations close on May 30th, so if you want to participate, head on over to the Ringo Awards site soon. May your favorites make the final list!